For Katie Cooke and I, another road journey began last Thursday 29 July. Over to Munich airport again, our third time this year for a race as we had been to Austria twice for the 70.3 and Ironman. So all was nice and familiar and we were feeling pretty relaxed and calm. We knew the Worlds would be hard as we had no taper, 10 days of hard training in the legs and an Ironman only one month ago but we didn’t quite realise how hard it was going to be! The day began with that early morning chill but soon warmed up nicely. The swim was competitive and ended up being a fight for the 4k. However it was the bike where the real damage was done. I love hills, the bigger the better but this was a course like I’d never seen before! We did 130k consisting of 1980 metres climbing with some hills being at 18% gradient. It was quite honestly a bike curse for lunatics. So came the run and within 1k of the 30k course it was obvious it was going to be mind over matter. Normally I look forward to the run and although hard there is a certain spring in my step but this was hell. My body wanted to stop, my mind not allowing it, and so the battle continued and without our usual support network of family and friends, it was a lonely run. The battle went on for a long time but deep down the teachings of a recent experience motivated me. 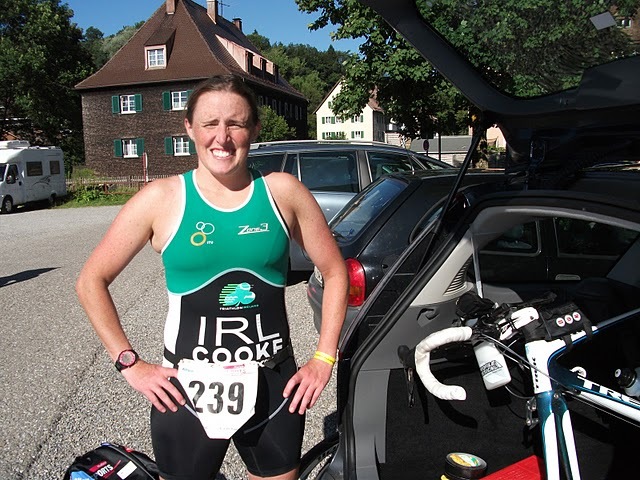 Unfortunately my sister Amy at the top of her game and unbeaten this year on the Irish tri scene has had to pull out of the rest of the season. So you never know when it might be your last race and each one should be enjoyed and appreciated as there are many people out there who would love to be in our shoes, pushing there bodies to the limit. Eventually the last trip around the track came and in the end the pain was worth it as I finished 1st in my agegroup in a time of 8.09, giving me the title of age group 30 world champion. A nice title for myself and Ireland and for my efforts I came home with a cow bell! (Prepare to see me supporting the local races with my cow bell in typical german style). This is also a win I want to dedicate to my sister and best friend Amy, who although younger (and of course not wiser) has thought me that “running hurts”! Katie finished an impressive ninth in our age group (8.55) and we both agreed that despite having raced plenty of tough Irish races and with several half and full distance Ironmans in the bag this was the toughest race of all. As they were saying after the race “I have been Immenstated”. I’m sure the rest of the Irish team consisting of Kay Hack (14th AG 45F 9.28), Michael Duffy (34th AG 30M 8.44), Adrian Phelan (78th AG 40M 9.27), Sean Court (72th 45M 9.54), Gary Kendall (76th 45M 10.02) would agree with this. 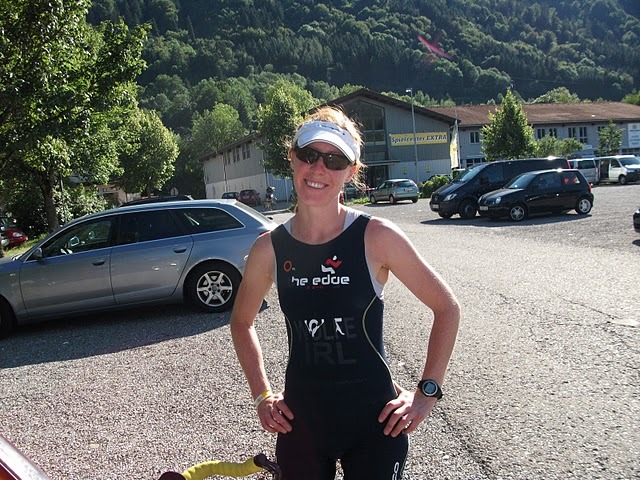 From here Katie takes herself to Kenmare for the Little Bo Peep triathlon as she is slightly crazy and I settle into preparations for Ironman World Championships in Kona, for what I know will top this on the mental and physical challenge and that is a very scary thought! However for those who are really looking for a serious challenge this is the one. It won’t be the long distance but they run a middle distance each year. It is set in the Eastern Alps, a stunning part of Germany, the people are friendly, the food great and its very easy to get to from Munich airport, but be prepared to be IMMENSTATED! !